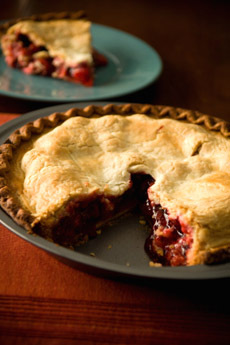 Your homemade cherry pie is more of a star with a great pie filling from Chukar cherries. Photo by Eric Hood | IST. CAPSULE REPORT: Chukar knows cherries. The company specializes in cherry products and makes delicious preserves, toppings and barbecue sauces and sells scrumptious dried cherries. How would they do with cherry pie filling and baking mixes? Better than other cherry pie fillings and mixes we’ve tried! If you’re set on making a cherry pie, these are the cherries to use. The products are all natural and certified kosher. Sometimes baking can seem like an all day event, but with a little help from Chukar Cherries, it doesn’t have to. Simple, delicious and 100% natural brownie mix and pie fillings allow you to enjoy the results as much as with old family recipes, but without waiting hours to eat them. There will even still be a spoon to lick. Chukar Cherries was named after a fluffy little bird similar to a partridge found in the northwest (see his image in the photo below). Of course, it loves to eat the local cherries. 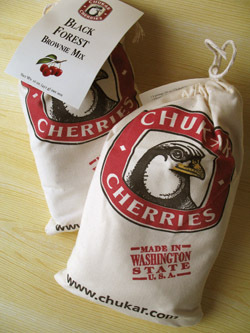 Chukar Cherries, the company, rounds up the finest cherries and sells them to cherry lovers nationwide. Luckily, the company has wrested most of the cherries from their namesake bird, and there’s plenty for us to enjoy. Since 1988, this family-owned company has been making gourmet cherry products in Yakima Valley, Washington. 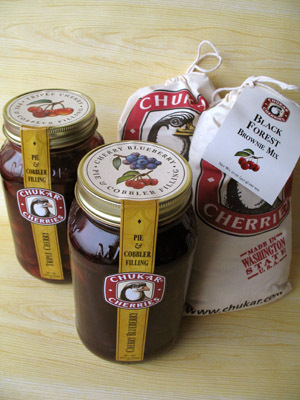 The number-one producer of sweet cherries in the world (Michigan is a number-one producer of tart [sour] cherries), Washington’s climate and cherry diversity enabled Chukar Cherries to come up with an large, distinctive line of products. And we’re happy about that! There’s nothing better than pulling a warm dessert out of the oven and filling the house with the spicy, sweet smell of baked cherries. An even better feeling is knowing you are using products that contain no trans fat, sulfites or preservatives. So, lick the spoon while your brownies, pie or cobbler is baking, and get ready to appreciate what these cherries have to offer. Black Forest Brownie Mix is named after the classic chocolate and cherry cake. Dark chocolate chips and dried cherries are a great marriage. The brownies are on the sweet side, but the dried cherries supply tang, as well as a bit of texture. Note to self: Next time we’re baking from scratch, add half a cup of dried cherries into Mom’s brownie recipe. Cherry Blueberry Pie and Cobbler Filling is juicy, tangy and tart with sweet blueberries and delightfully tart Montmorency cherries. Cobbler filling, of course, is a multitasker, and we made pie as well as cobbler. When we think of pies made in years past with fillings from the supermarket—the kind of filling that is used in diner pies—we blush. The difference with Chukar’s fillings is more than night and day; it’s night and springtime. The filling is also a delight in crepes, or as an ice cream topping. Brownie Mix in pretty gift sacks. Product photography by Claire Freierman | THE NIBBLE. By the way, Montmorency cherries are the variety generally found in pie fillings—their tartness gives dimension to a sweet pie. The reason you don’t see them fresh in the produce section is that they’re very perishable: They’re harvested and quickly processed. Triple Cherry Pie and Cobbler Filling is a cherry enthusiasts delight. Bing, Rainier and tart (Montmorency) cherries unite in a unique but distinctively sweet cherry filling that could become a pie, cobbler, tart or crisp, or more creatively, top muffins, fill omelets, complement apple pies or top ice cream (do the same with the Cherry Blueberry Pie and Cobbler filling). The handsome mason jars that hold both cobbler fillings were recycled and put to immediate use in our kitchen. These “kitchen aids” work not only in your kitchen—your friends will enjoy them as gifts. And, for those who are just learning to bake, it’s an easy entry. A journey of 1,000 pies begins with a single good cobbler filling. Prices and product availability are verified at publication but are subject to change. Products are not sold by THE NIBBLE but by a third party. Shopping information is provided for your convenience. Cherry pie and cobbler fillings (jars) and brownie mixes (bags).